– John Tavares opened the scoring for the Maple Leafs at 3:02 of the second period and later collected the secondary assist on Andreas Johnsson’s third period goal. Tavares has scored the first goal of the game on eight occasions for the Maple Leafs this season, which is tied for the most first goals in the NHL. Tonight’s game is Tavares’ 16th multi-point game of the season. – Andreas Johnsson registered the primary assist on Tavares’ second period goal and later scored Toronto’s second goal of the game at 13:40 of the second period before picking up the secondary assist on Jake Muzzin’s second period goal. He scored the sixth Maple Leafs goal of the night at 14:51 of the third period. Johnsson has recorded 20 (10-10-20) of his 24 points on home ice this season. Tonight’s game is his seventh multi-point game of the season. His four points establish a new single-game career-high for points in a game. – Jake Muzzin picked up the secondary assist on Johnsson’s second period goal and later scored the third Maple Leafs goal of the game on the power play at 19:57 of the second period before collecting the secondary assist on Brown’s third period goal. Muzzin’s assist is his first point as a Maple Leaf. His goal is his first goal as a Maple Leaf. Tonight’s game is his fifth multi-point game of the season. Muzzin’s three points tie his career-high for points in a game (3 – 6x). – Connor Brown scored Toronto’s fourth goal of the night at 3:16 of the third period. Brown has five goals in 52 games this season. The Maple Leafs are 5-0-0 when Brown scores a goal this season. 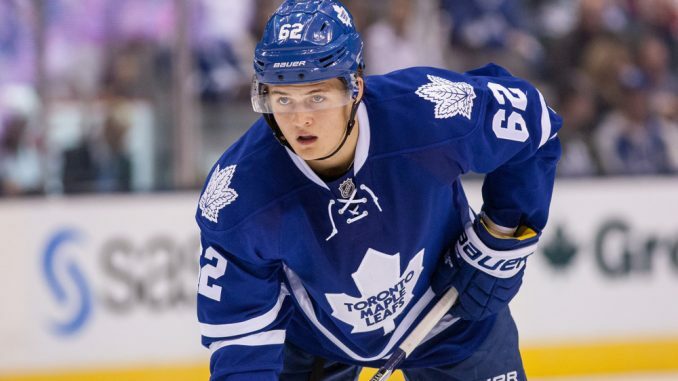 – William Nylander recorded the primary assist on Brown’s third period goal and later scored the fifth Maple Leafs goal of the game at 6:04 of the third period. Nylander has six points (1-5-6) over his last five games. Tonight’s game is his third multi-point performance of the season. – Frederik Gauthier collected the secondary assist on Tavares’ second period goal. Five of Gauthier’s seven assists have come at Scotiabank Arena this season. – Patrick Marleau recorded the primary assist on Johnsson’s second period goal. Marleau has assists (3) and points (1-3-4) in three consecutive games. He has two points (1-1-2) in two consecutive games this season. – Jake Gardiner registered the primary assist on Muzzin’s second period goal. Gardiner has assists (3) in two consecutive games. He has two assists in two games against the Ducks this season. – Zach Hyman had the lone assist on Nylander’s third period goal and later recorded the primary assist on Johnsson’s third period goal. Hyman has points (1-2-3) in two consecutive games. Nine of his 12 assists have come against Western Conference opponents this season. Tonight’s game is his first multi-assist game of the season and his third multi-point game of the season. – Frederik Andersen stopped 24 shots to earn the victory. The win is Andersen’s 95th win as a Maple Leaf, which moves him past Ed Belfour for sole possession of ninth on the franchise’s all-time wins register. – The Maple Leafs are 16-11-1 at home this season. – Toronto’s all-time record is 27-11-5-1 in 44 games against the Ducks and 16-3-4-1 in 24 games played in Toronto. – Toronto is 13-7-0 against the Western Conference this season and 8-2-0 against the Metropolitan Division. – Tonight’s attendance was 18,858. – The Maple Leafs were 1-for-1 on the penalty kill and 1-for-3 on the power play tonight. Toronto is 19-9-1 when not allowing a power play goal this season and 10-5-0 when scoring one power play goal. – Toronto is 23-5-1 when scoring the first goal of the game. – The Maple Leafs are 7-6-1 when tied after one period and 25-0-0 when leading after two periods. – Toronto is 13-8-0 when outshooting their opponent. – The Maple Leafs are 4-3-0 in Monday games. – The Maple Leafs won 68 percent (21 won, 10 lost) of their offensive zone faceoffs and 68 percent (13 won, 6 lost). – Frederik Gauthier, Andreas Johnsson and Par Lindholm were the lone Maple Leafs to not start a 5-on-5 shift in the offensive zone. – William Nylander was on the ice for a team-high in Toronto shot attempts-for at 5-on-5 (32). Nylander had a 5-on-5 shot attempt percentage of 72.7 percent (32 for, 12 against). – John Tavares won 67 percent (11 won, 5 lost) of his faceoffs when matched up against Anaheim centre Ryan Getzlaf. I just thought tonight, especially – I think we got credit for one power play goal, but we actually scored two, just at the end of it – but I thought his shot was important in that. The way teams have played against us on the power play, they’re basically just playing down low. They don’t respect the top so they’re going to have to do a better job of that. I thought Muzz’s area with his shot really helped. The other thing is he’s a big body, he knows how to play. You don’t win two Stanley Cups by accident. You know how to play. He’s really good in his own zone, denies the back, makes a good outlet pass, he’s a big body and plays real hard between the whistles. Obviously, with his experience and the kind of man he is, he’s going to make us a better team. Well, I mean, obviously real good. If you go back over Johnny’s career here with the Leafs, he’s started the same way every year, so we’re going to have to change something there. But, obviously, he’s a good player. He’s got a tenacity, makes people mad out there, which I like. He goes into the hard areas and he’s not scared to go into the hard areas. That’s why he has the puck a lot. He obviously had himself a good night. Obviously, confidence. He’s got the ability, as we all know. We think he has a chance to be a real important player for us, he’s just got to get his confidence back. You get confidence back by working and competing and doing good things. The next thing you know, you’re rewarded. Good for him. No question about it. It’s like anybody, he’s a scorer. All you’ve got to do is look at a guy like Matthews who went through a period there where he wasn’t scoring. As soon as they score, it’s like adrenaline and then you see it in their play and they’re jumping. You’ve seen it a lot, he just didn’t hit the net. When he hits the net, he’s dangerous. He can shoot the puck, he’s got skill, he can make plays, he can transport the puck, he can be dangerous all over, he’s good in the faceoff circle. He’s a real good hockey player. That’s why we have him. I thought we came out strong. When we played really quick I thought we had a step on them, especially early. That was great. We got the breaks later in the game when we started putting them in. I thought we played really quick and moved the puck well. We were able to catch them a little bit. You saw it today, he had a good opportunity there. A good few minutes of his to stay calm when they were trying to go at him a little bit. His experience showed there. Like you said, great shot. It’s huge, you have a couple big hits now in the beginning and it’s going to create space for skilled guys. I think that was a part we didn’t have before and he’s been doing a great job since coming here so far. The fans get pumped up and we get pumped up too and it creates a lot of energy. So yeah, it’s good. Just another hit. I was just trying to close and force a play before the blueline really and sometimes the hits are there and sometimes they’re not. When they’re there I’m going to try and make them and when they’re not, I’m not going to force it. Good team, good coaching, good plan and it’s easy to follow. They are very clear on how we’re supposed to play and that’s how we’re playing and especially with [Rielly], having a good partner helps it out as well. I think it’s coming together, some games better than others. Now it’s trying to get on a consistent basis every day. I think I still have a little bit more to go, but today was a step in the right direction, for sure. I think we’ve been able to create a lot of chances. We could have had some more tonight. That’s what happens, the bounces will come next game. Russian Disinformation How Effective Is It? AT LAST – CHARLIZE HAS COME TO HER SENSES AND SPLIT WITH SEAN PENN! HOORAY!